Before piling on all of the how's and why's of hardness testing, I will comment that it is not an exact science. It has no basis in nature and there are no natural standards to check the results against. Hardness is basically the resistance of a given piece of material to the penetration of a standardized indentor under controlled conditions. It makes me ill to see people who don’t even know what a Hertz equation is dictating hardness requirements as if it were based on the speed of light. It makes it very difficult when you are dealing with an administrator who has absolutely no technical knowledge of the rather complex subject of hardness testing, when he has been ill-advised of hardness test results. Every measuring process is error-prone, and hardness testing is no exception. I am still waiting to see a published error budget for anyone’s hardness testing facilities. I have talked to the researchers at N.I.S.T., and I have attended their seminars. I have visited the Italian national standards lab, which is a kind of expert among the experts on hardness testing. Both of these facilities are only willing to bless the Rockwell “C” scale hardness measurements. Every metallurgical technician that I have ever met seems to somehow think that their hardness test machine is the holy grail, and that it is error free. Why all of this uncertainty? Hardness testing, for the most part, is based on the permanent displacement of the molecular structure of the material being tested by an indentor, that is motivated by a force that exceeds the yield strength of the material under test. A very important point to make here is that for the vast majority of cases, hardness is the measurement of a permanent, not at all elastic deformation. Spring back or elastic recovery is no part of the hardness test. What we are saying here is the hardness is measured after spring back or elastic recovery has occurred. There are some specialized hardness tests that are an exception to this rule, but we are not involved with any of them here. The majority of our company’s experience is based in the bearing industry, where stresses are exceedingly high and unreliability of the product can be life threatening. The Antifriction Bearing Manufacturers Association ( ANSI/ AFBMA ) standard specifies that, the hardness of precision balls must be measured between flat parallel surfaces generated on the test ball. To gain a better understanding of the complexities of a hardness test, we will take a quick look at the one most common test of hard materials worldwide, the Rockwell “C” test. Starting with the penetrator or indentor that is precision ground from a natural diamond. The quality of the indentor is usually measured with a high magnification optical comparator (shadow graph). The very end of the indentor is formed by a spherical radius of 0.2mm (0.008 inches). This spherical radius must be perfectly tangent to and concentric with the 120° conical body of the indentor. To be perfect, the conical angle must be exactly 120° and the cone must be absolutely round with an angstro-quality surface finish. Generating this quality is no small feat, as a cone has an infinitely varying geometry, in that the radius is different at every elevation, making it the very most difficult basic geometry to generate. It is important that the working end of the indentor be concentric to the cylindrical diameter used to locate it in the Hardness test machine, but even more important is the squareness of the axis of the working end of the indentor and the shoulder, through which the force is applied to the indentor. There are two loads applied sequentially during the Rockwell “C” test. The minor load is a light 10 kg (22 pounds) load that is used to force the diamond indentor through the surface clutter. A load cell or Proof Ring should be used to actually test this force. The additive major load is a considerable 140 kg (308.7 pounds) that is slowly applied through an oil-filled dashpot. The major load should be accurately measured with a load cell or proving ring. If we eliminate operator errors and the impact of the environment, which are none the less real factors in the test, we have “A” the tip radius, “B” the conical angle, “C” the concentricity of the spherical radius to the conical angle, “D” the tangency of the spherical tip to the cone, “E” the accuracy of the minor load, “F” the accuracy of the major load and, “G” the smooth application of that load, through the oil-filled dash pot. All of this is factored into the hardness test even before we look at the accuracy of the linear measuring device that evaluates the depth of the diamonds penetration. Each point of Rockwell “C” represents a depth of penetration of only 0.002mm or 80 millionths of an inch. Each point of HR Superficial Hardness is only 0.001mm or 40 millionths of an inch. The functional test of all these variables is the hardness-test block or coupon. If the test machine were theoretically perfect, the best commercial test blocks are only accurate to plus or minus one half point of HRC and there is often a half of a point variation in different location on the same test block. This amounts to at least one full point of uncertainty before we even look at the machine itself. The dilemma of developing a serious error budget for a hardness test machine is strongly affected by the complex variability of these tests. If the conical angle of the Rockwell diamond “brale” is off one degree, what effect will it have on the hardness test? This error would obviously have more effect on an HRC 20 measurement than it would have on an HRC 60 measurement, because it would have so much deeper penetration of the HRC 20 indentor. What effect will slight variations in the applied loads have on the final reading of a HRC 20 as compared to an HRC 60? As if all this variability weren’t enough the time that the diamond is left at load will change the reading and any vibration imparted to the hardness test machine during use will lower the hardness reading. Then there are the variables that do not repeat for every measurement. Chief among these is the complex measuring device that indicates the final depth of penetration. How do you generate parallel flats on the balls that will facilitate an accurate hardness test? On small balls a group of test parts are typically mounted together in a plastic puck. The surface of the balls are ground flat, with the flat back face of the plastic puck, providing the parallel. Each one of this group of balls is tested for hardness individually. When balls under one quarter of an inch (6.3mm) in diameter must be evaluated for hardness, using the Knoop or Vickers method, the flat surfaces on the balls are flat lapped and polished. To provide mechanical stability the back surface of these plastic pucks should be flat lapped. Somewhat larger diameter balls can be clamped to grind the parallel flats. Balls that are five-eighths of an inch diameter (16mm) and larger are surface ground flat and parallel. For hardness testing very large and therefore very expensive balls an alternative hardness test method must be used. This alternative method is used for hardness testing balls made of exotic materials that may cost hundreds of dollars a piece. Using this coupon method, a flat parallel test coupon made of the exact same lot of material heat treated along with the balls is used for the hardness evaluation. To sum up this brief discussion on measuring the hardness of balls, the hardness must be measured between parallel flats. Balls smaller than one quarter inch (1/4", 0.25", 6.35mm) diameter must be measured with a microhardness or superficial hardness test machine and the equivalent hardness compared with the HRC requirement. You must be aware that conversion tables are only approximations, so for very accurate conversions a transfer coupon of the same material heat treated to the same hardness must be used to give actual comparative result. Some years ago there was a question raised as to the accuracy of a 58 HRC minimum hardness test made on some 3/16 inch (4.76mm) balls. They checked 59 HRC equivalent, using the Knoop Micro Hardness test with a 500 gram load, that was performed in our facilities and this Knoop hardness number was converted to HRC equivalent. The customer questioned the reliability of the Knoop test (it wasn’t the test specified on the blue print) and they questioned the reliability of any conversion made from Knoop to HRC. We decided to explore the feasibility of measuring the 3/16 inch (4.76mm) diameter precision balls directly on the HRC scale. We can routinely measure 1/4 inch [6.35mm] diameter balls directly on the Rockwell “C” scale, so the question was where is the cut off point? The first try was to surface grind and flat lap some of the test balls very flat and parallel. No matter how carefully we centered the balls under diamond indentor they always read up to three points too soft. Deciding that three points of HRC really wasn’t very much, (only about 0.00024 inch), [0.0061mm] we began experimenting with methods to provide more support for the balls being tested. We made up a test mount of 2-inch diameter, 1-inch thick steel, ground and lapped very flat and parallel. We machined a ring of very precise conical counter-sinks in the flat top surface. On top of this steel puck we mounted samples of the 3/16” inch [4.76mm] diameter precision balls using an ultra high strength epoxy with a one micron aluminum oxide ceramic filler. We surface ground flats on the balls and checked them on the HRC scale. The results of these tests were the same approximately three points softer reading as before. Next we took a 2-inch diameter steel washer that was about 3/16 inch (4.76mm) thick. We drilled and reamed some 0.185 inch (4.7mm) diameter holes through the flat surface of the washer. We press fit a ring of balls into these holes that had been drilled and reamed in the flat parallel washer. We then surface ground and flat lapped the washer and the ring of balls, flat and parallel. We were delighted when the first three measurements were all well over the 58 HRC minimum. The fourth measurement was 57 and then they varied from 55 to 59 with no pattern. We tried several more times but the results were the same inconsistency. We purchased a giant diamond anvil for the Rockwell Hardness test machine. This anvil is intended for use on very thin sheet metal. The idea is that the exceedingly stiff diamond anvil would withstand any tendency to bend under load. We repeated the first three tests using this giant diamond anvil. But the results were basically the same low readings as before. We hot mounted and tested some of the balls in Bakelite metallurgical mounts with basically the same results. We mounted some in “quick mount” (this is a cold mounting material) to eliminate the possibility that the heat used to cure the Bakelite mounts was tempering the balls, but the results were the same. Some of the metallurgically-mounted specimens were measured on the HR15N-superficial Rockwell hardness scale and the value was converted to HRC. All of these readings measured with in the specification. The customer still complained about the accuracy of the conversion of the HR15N scale to HRC scale. With our out of pocket cost of probably $10,000, by now and an intensive month of time spent, the overwhelming evidence and some ASM citations, we were able to sell the $200.00 worth of balls to the customer. Our conclusion is that the 308.7 pound (140 kg) major load added to the 22 pound (10 kg) minor load placed on the 120° Diamond Brale indentor of the HRC test is causing yield of the physical configuration, of the limited volume of the metal in a 3/16 inch diameter ball and that HRC simply can’t be used on such a small diameter ball without some as yet not available support mechanism. As stated before, it will however work perfectly on 1/4 inch [ 6.35 mm ] diameter balls and larger. It would be interesting to measure the permanent distortion of the hardness-tested balls. They did not crack at all, but there must have been some serious physical distortion. It would be interesting to build a tungsten carbide puck with a nearly perfectly matched 3/16 inch [ 4.76 mm ] diameter hemispherical cup to place the balls in for rigid support during the hardness testing. There are probably many other interesting approaches that could be tried, but alas where is the money to support this quite expensive, highly labor intensive, research going to come from? To the best of our knowledge, the work of our company in these areas is the only material that has yet been published. Other companies must have done similar research, but it’s a big secret. We wouldn’t want the customers to get too smart seems to be the pattern. Since this work was published, we have developed a quite different approach to the hardness conversion problem. The problems of accurately converting between two different hardness test methods are daunting indeed. This conversion problem usually occurs when the required hardness value is given for one hardness test method, but due to some constraints the product can’t be measured by that method. A typical example is small diameter bearing balls. Here the hardness is always given for the Rockwell “C” scale, but the additional 308.7 pound (140 kg) major load [technically it is 330.7 pounds (150 kg) because both minor and the major loads are additive] when placed on the 120° diamond indentor for this test would totally destroy a small diameter ball. There are conversion tables available, that give the equivalent hardnesses on the various scales. Due to the large number of variables involved in these conversions, generalized tables will not be accurate enough for critical applications. This critical problem is much more common than might be expected, at least in the bearing industry. Type 440C, a hard stainless steel, is the second most common steel used in the bearing industry. This material is generally specified at 58HRC minimum, which is typically the hardness that this material ends up after heat treat. To minimize the amount of retained austenite, after hardening 440C, this material is usually tempered at the fairly high temperature of 400° F. This high temperature will slightly reduce the as-quenched hardness of this material. If you would like that nice warm feeling that you get when you know what is going on, you should build yourself a simple transfer standard that you can evaluate with both of the hardness test machines involved in the conversion. You should evaluate each of the variables involved in both of hardness tests and try to minimize the variabilities of each one of them. At this point I would like to expound on some of the logic that should be used to end up with a conversion system that has the smallest error budget possible. This is one of the few times when the system is actually working with you. Rather than depending on the conversion tables with all of the potential errors involved, we will build a coupon, or artifact made of the problem material, heat treated in the normal manner. The best design for the coupon is a very thick, washer shaped part. This design is very rigid but it will still harden uniformly. The donut design is chosen for two reasons, the center of cylindrical bar stock has the majority of porosity and chemical variations and the hole provides better quenching in heat treatment. The truly accurate “SRM” sold by N.I.S.T. are made of flat plate raw material not cylindrical bar stock. Flat plate material provides more uniform macrostructure, but this form of material is not readily available in materials of interest for our applications. The specification for hardness in the bearing industry, is always given in Rockwell “C” hardness so we will make the original calibration with this equipment, on this scale. We fully expect some small disagreement in equivalents that are given on the charts, when we use the alternative hardness measuring technique, whether that is knoop, Vickers, or superficial Rockwell hardness. The only real variable in our approach to hardness conversion is the accuracy of our original Rockwell “C” measurements. 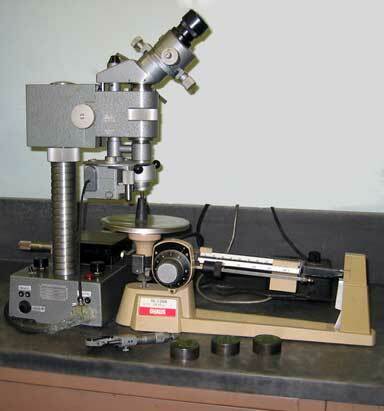 As long as the actual piece of hardness test equipment that you use to standardize the hardness specimen with, is the same piece of equipment used, to measure the test part with, the overall error budget is uninfluenced by systematic errors in this hardness test equipment and its measurements. In the very worst case situation we have found as much as two points of Rockwell “C” Hardness difference between the true as measured hardness value and the equivalent hardness value according to the conversion tables. The hardness of the materials, that we typically work with are in the HRC 60 range. Part of this disparity between the two systems may stem from the fact that for technical reasons we generally use the Knoop Microhardness technique. In published studies, by a number of labs, very hard parts have consistently measured very slightly softer when using the knoop method, than they did using the Vickers or superficial hardness techniques. In the experiments that we have conducted, with the materials that are typically used in the bearing industry, the harder the material, the greater the disparity between, the as actually measured and the equivalent hardness according to the conversion tables. In order to make this transfer standard as accurate as possible, using the Rockwell “C” hardness as the standard, we will carefully validate each one of the variables that make up this measurement. To put it another way our Rockwell “C” test will be the standard that we use for making the conversions to the other hardness test, so we want it to be as accurate as possible. We will start by evaluating the indentor. The tip radius of the Rockwell “C” indentor is 0.2mm or 0.008 inches. This spherical radius should be exactly tangent to the 120° angle of the body, of the cone. A shadow graph (optical comparator) with a magnification of 50x or more can give a satisfactory evaluation of these characteristics. There are two forces involved in the Rockwell “C” test. The minor force is a small 10 kg (22 pounds) load that is usually provided by an adjustable spring. The major or main force is substantial at 140 kg (308.7 pounds), cumulatively 330.7 pounds (150kg). Measuring these forces is a straight forward process. First remove the diamond and replace it with the 1/8 inch diameter spherical indentor. Place a proving ring or load cell between the table and the indentor and raise the table to apply the minor load of 10 kg (22 pounds), as indicated by the very small hand on the dial of the hardness tester. This is not the most critical variable, but if it is off it should be corrected by adjusting the spring force that applies this load. The relatively heavy major load of 140 kg (308.7 pounds) is applied through a lever system. This heavy load may require a different load cell or proving ring. It should be noted that when the secondary or major load is applied it is added to the primary load so the total load will be 150 kg or (330.7 pounds). The DROP RATE of the major load is controlled by an oil escapement dashpot. To evaluate this process, release the diamond without any test part in the machine. The descent of the diamond should be a smooth steady process without any noticeable speed changes. Using this technique we are able to limit the overall error budget of the conversion to the accuracy of the Rockwell “C” measurement and any random errors in the comparative hardness measurement. Variations due to material differences, of hardening technique differences, and all systematic errors in the comparative hardness test equipment are eliminated. Preparing balls for hardness testing can harbor some unexpected problems. In my days as a student of metallurgy, I had already worked for several years in the bearing industry. When the subject of a research project came up, I choose to study the effects of heat treatment on the properties of the universal bearing metal, E52100, chrome alloy steel. One of the very interesting effects that I observed was that C/S will repeatedly soften with each of several tempering cycles of only 325°F. Many years later when we were confronted by an irate customer who claimed that some small C/S balls that we sold them were only 55HRC instead of 60HRC minimum, we embarked on a test program to evaluate these balls. We had some pieces of these balls still left in stock. We retested the hardness on some samples of these balls, using the standard Knoop microhardness method with a 500 gram load. We then converted the Knoop to HRC equivalent and found them to be well above the minimum hardness requirement. The customer continued to rant. They finally supplied us their Bakelite metallurgically mounted sample of the balls in question. The hardness of the balls in this mount measured all over the place, from 55 to 60HRC equivalent. Because cyclical heating in my experiments had caused a progressive reduction in hardness with each cycle, we tried some experiments. We hot mounted the balls in Bakelite and got up to two points of drop in HRC, depending on the curing temperature we used. These balls mounted in Bakelite were still within tolerance. We also wood pitch mounted some balls on a steel puck with similar temperature related results. These balls were still well within tolerance even when we used high temperatures. We disk sanded the set of mounted balls dry (without coolant) and got an additional three point drop in hardness. This put these sample balls out of tolerance. We belt sanded another set of mounted balls dry (without coolant) with the same approximate three point drop. This sanding also put these sample balls out of tolerance. You should remember that both of these processes reheated the balls for a second time. This first heating was the Bakelite mounting. Even with wet sanding there was a very definite drop in the hardness of the balls, but they were still well within tolerance. We could also measure a small drop in hardness of something less than one point when the mounted balls were ground on a wet surface grinder. When you see sparks, it means that the surface temperature was high enough to incinerate the steel which is about 5000°F. The volume of metal in a minute ball is so small that the body temperature of the balls can easily reach a level that sub-critically anneals the specimens. After documenting these bad results, we went the other way. We mounted the balls on a flat parallel steel puck with Duco (model makers glue, cement) to avoid any heat at all. We roughed the tops of the balls down on a course silicon carbide stone with slow strokes, by hand. We then flat lapped the balls on a cast iron plate and polished the flats on a metal plate by hand. These balls measured more than one point harder than any other method of preparation. When we finally motivated this customer to use “quick mount” instead of Bakelite and to wet process the samples, the balls tested well with in the specifications. With the quite broad tolerance of 60-65HRC for chrome steel balls, we have not changed our standard test procedure, however we are aware that even careful preparation is reducing the absolute hardness of some precision balls at least slightly. One of the things to do about problems with a hardness test is to literally take a good look at the indention made by the hardness test. We got into a difficult situation on the hardness testing of some type 440C CRES ( Corrosion Resistant Steel ) miniature balls. The hardness was called out to be 58 minimum on the HRC scale. They tested well within this tolerance using a 500 gram load on a Knoop micro hardness test. The Knoop hardness reading was converted into HRC equivalency. We weren’t able to resolve our differences with this customer, so we agreed to have an accredited outside metallurgy lab arbitrate the measurements. The company that was wrong would pay the bill. The outside lab evaluated the hardness using the Knoop micro hardness method, with the results converted to HRC equivalency. They found the balls to be well within the hardness tolerance. The customer claimed that this was not a valid way to evaluate the hardness and that it had to be done using the Vickers micro hardness method. There are so many specifications and author’s personal opinions, that if you look hard enough you can find support for almost any position. Many who are experienced with micro hardness testing will tell you that these two methods are entirely compatible. If anything, the Knoop method will be more accurate because the indention is larger, thus making it easier to accurately read with the microscope. You only have to make one optical measurement, instead of having to take two measurements and averaging them, as you do with the Vickers method. In published hardness test evaluation after hardness test evaluation on hard ferritic material, the Knoop test evaluated the same parts very slightly softer than the Vickers test. To our amazement, when the Vickers hardness test measurement came back from the outside lab, they showed a much lower hardness. Here is where my admonishment for you to look at the indention, comes in. We looked at the tiny Vickers indention with a 400x metallurgical microscope. At the surface of the part, the indention was razor sharp; but in the bottom, it looked all chewed up. The tip of the Vickers indentor is a very sharp 135° point, but someone had chipped the diamond indentor that they used for the test, so that it was a very ragged with the tip gone. In this condition, the indentor penetrated the part much more deeply, making the part measure softer than it really was. When I called the lab and talked to the technician, hoping to save him some face, he told me in no uncertain terms that their lab was ISO-17025 certified and that they couldn’t make a mistake. I had my laugh for that day. Outside of the obvious fact that they had just measured these same balls to be a much higher hardness number using the Knoop system, they hadn’t done any rationalizing of the two reports. They obviously had not compared their readings with the Vickers indentor against a known hardness standard or they would have identified the problem ahead of time. When I wrote up our final report with several ASM citations. The whole problem resolved itself. The hardness indentor is generally considered the linchpin of the hardness test. There are a number key parameters on the hardness indentor that can be inspected with ordinary, commonly available shop equipment. Use a fairly powerful stereo microscope of about 30x to carefully look at the indentors. Some of the very important problems with the diamond indentors that will be vividly apparent under the stereo microscope are: chips, cracks and striations caused by wear (after long use). Chips always start on the very tip of the diamond. Look straight down on the end of the diamond indentor while slowly rotating it with your fingers under the Stereo Microscope. The Diamond is transparent, so you must very carefully focus the microscope on the surface, not on a much shinier image that is actually inside the diamond. Nicks and dents on the shoulder that locates the indentor in the hardness test machine are clearly visible under the microscope. These are always caused by mishandling or faulty storage. A diamond charged lapping tool with a close fitting hole to match the shank of the indentor will quickly remove any proud metal on this surface. This is important because perturbations on this shoulder tilts the indentor off the axis of the hardness test machine and biases the readings. The diameter of a ball indentor can be verified with a hand held micrometer. The same ball indentor shouldn’t be used on a large number of parts. The harder the part being evaluated, the shorter the ball indentor’s life expectancy will be. When in doubt, look at the ball under the stereo Microscope. The ball should be highly polished, without scratches or flats. A note at this point: steel Ball indentors are not standard bearing balls. These balls are heated above a critical temperature and then quenched, but they are not tempered. They are harder than standard bearing balls and they are much more brittle. It is common practice today to use Tungsten Carbide (T.C.) ball indentors. The use of T.C. ball indentor should be factored into the hardness reading. Unless you have some extremely sophisticated measuring capabilities at your disposal, an optical comparator (shadow graph) will suffice for evaluating the geometry of diamond indentors. The magnification of the optical comparator used should be 32.5X minimum and 50X is preferable. The indentor should be held in a device that presents it at exactly right angles to the light beam, so that the indentor only has to be slowly rotated, to find the exact tangent point, that will allow you to critically evaluate the angles of the cone or facets that make up the working surfaces of the diamond indentor. The optical comparator will show up any serious errors in the geometries of the indentors, but we still prefer a stereo Microscope for detecting flaws. The diamond brale Rockwell indentor has a 0.2mm (0.008 inch) radius on the end of a 120° cone. A Vickers diamond is a square base pyramid with 136° Angles. A Knoop diamond is a rhombohedron with a 172° top angle and 130° side angles. One of the factors often overlooked on Micro Hardness indentors is their weight. The weight of the diamond indentor is added to the force applied to the part during test. We had one situation when the new diamond weighed in at 6 grams when it should have weight only 4.5 grams. This weight can be verified with a balance scale, a triple beam balance, or any other accurate weighing device. What are some of the things to look for when you have problems with hardness measurements? Hardness test problems often show up as different hardness values measured by different hardness test machines. What problems should you be aware of even if you don’t know that you have any problems with your hardness testing? The first thing is to take a serious look at the hardness test machine itself. We got into a difficult situation on the hardness testing of some fairly small diameter balls. They tested good when evaluated on the HR 15N superficial hardness scale in our metallurgy lab and the lab of a local heat treater. The customer insisted that the balls were far below the specified hardness. The problem got so serious that I paid a visit personally to the customer's metallurgy lab. Sloppy work starts at the front door. My visit to this lab was on a hot day in July. To start out with, the front and rear doors of the lab were wide open, with a good breeze blowing through the place. They had no temperature control; they didn’t even have air conditioning. Without a reasonably stable temperature in the 68°F range, how could anyone imagine that accurate measurements could be made? Each point of hardness only amounts to millionths of an inch in depth. (80 microinches for HRC and only 40 microinches for HR15N). There were coffee cup stains all over the tables and many of the flat areas of the equipment. Two of the four technicians in the lab were smoking cigarettes, and of course, the hardness test machine was in total disrepair. This had been a well equipped lab at one time; but for a lack of management, it had turned into a cesspool. They were using a universal hardness test machine in the automatic mode, and it was indeed giving them low readings for the hardness of these balls. When I took over the machine and switched it to manual mode I noticed the jack screw on their machine hadn’t been serviced in such a long time that it was impossible to even budge the table by hand. It turned out that the motor-driven worm gear box used in the automatic mode was so powerful that it was able to overcome this bound up lead screw, but it did it in a series of jerks and jumps that drove the diamond Indentor deep into the test part, giving a false evaluation of the final hardness reading, making the material appear softer than it really was. The temperature of the room wasn't helping either. This machine had been serviced and certified by the original equipment manufacturer six months earlier. The machine was on a yearly calibration cycle, so apparently the last time anyone had checked a hardness specimen was six months earlier. With all of the variables that are involved in the hardness test, each machine should be checked at least once each day with a hardness test block in the same hardness range that is to be used. Some other fine points to check on hardness test machinery include: After long use the end of the spindle that holds the diamond gets circular rings worn into it mostly by operators rotating the indentor. This can be quickly corrected with diamond charged flat, parallel lap. The same is true of the top surface of the jack screw and, by reversing the diamond lap, that too can be corrected. Use the smallest anvil that will safely support the test part. This will avoid rocking and tilting that can seriously affect the results of the hardness test. Many of the test parts are like potato chips when you are measuring millionths of an inch. If these out-of-flat parts are placed on a large flat anvil they will wobble around and/or bend when the hardness test force is applied. It should be recalled that on the HRC scale, a total force of 330.7 pounds (150 Kg) is applied to the test part (the minor and major loads are additive). The jack screw that is used on many hardness test machines should be lubricated very frequently, even daily if the machine is receiving heavy use. The actual load, or loads, that are being applied to the test part should be checked in actual operation. The levers and knife edges used to apply the very substantial loads used for most hardness tests can malfunction. Careful preparation of the test part is paramount. These surfaces should be flat and parallel within 2° if possible. Whenever possible the hardness test should be made between flat, parallel surfaces, not cylinders or spheres. The hardness test part should be prepared for the test without raising its temperature. Metallurgical hot-mounting processes can seriously reduce hardness of some metals.